Side-impact collisions are one of the most dangerous types of motor vehicle accidents for victims. When cars are impacted on their side, the resulting crash is more likely to result in serious injuries for the vehicle’s occupants. Read on to learn more about side-impact collisions, and find out if you’re entitled to money damages if you’ve been hurt in a side-impact crash. Side-impact collisions include any type of crash where one vehicle is hit on its side. These can include side-swipe or lateral-impact crashes, where vehicles strike one another on their side, and T-bone collisions. T-bone crashes, also known as broadside collisions, are the result of a vehicle that’s facing head-on colliding with another vehicle somewhere along its side panel. According to the National Safety Council, side-impact collisions are ranked as the second-most deadly form of motor vehicle accidents, following head-on collisions. About 1/4th of all fatalities stemming from motor vehicle accidents are caused by side-impact collisions. The deadliness of broadside collisions is attributed in large part to passenger vehicle design. 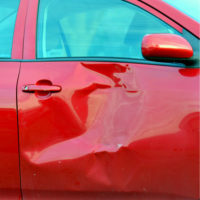 The sides of passenger vehicles are necessarily one of the weakest parts of the car, in terms of ability to absorb impact. Passenger doors must be light enough for passengers to open easily, which prevents them from being composed of highly sturdy materials. They also include windows, making them even less capable of absorbing impact. These accidents can become even more dangerous when there is a large size and height disparity between the vehicles involved. When a raised truck or SUV impacts a lower-riding sedan, the grill of the truck or SUV becomes more likely to collide directly with the windows of the sedan, rather than the door, doing little to reduce the impact for occupants. Side-impact crashes are often the result of negligent driving in intersections. These crashes happen when one driver fails to yield to oncoming traffic or chooses to speed through a red light. Drivers who fail to correctly gauge the speed of traffic when turning left at an intersection can also be responsible for causing T-bone crashes. If you’ve been a victim of a side-impact crash, evidence of the at-fault driver’s violation of traffic laws can support your claim for damages. If you need skilled and dedicated legal representation after a broadside or T-bone crash in Washington state, contact the Vancouver offices of personal injury attorney John Lutgens for a consultation, at 360-693-2119.